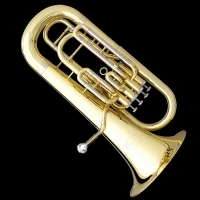 This Sanders Euphonium blows freely in all ranges and produces a very good characteristic tone. * Rental applicable for local Detroit area residents only. This instrument is the perfect 3/4 size tub. It was designed especially for Elementary and Junior High School Instrumental music programs under the influence and guidance of Prof. Daniel Perantoni of Indiana University (Worldwide Tuba Artist and Educator). 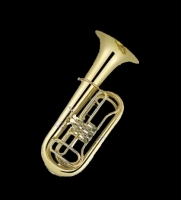 This tuba is a 4/4 full size concert tuba which features a 16 1/2" bell, four rotary valves, .750 bore and open wrap slides for an easy free blowing characteristic. This model is our most recent addition to the Sanders Line. The Sanders Conservatory is a quality instrument at a modest price. 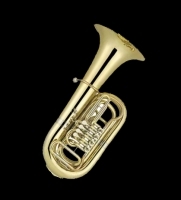 This is a full brass sousaphone for those who prefer the better sound quality of a brass instrument and don't worry about the weight of the equipment as much. 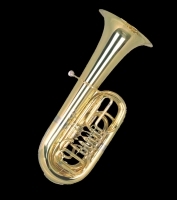 This is a powerful sousaphone that will hold the sound together at all volumes.